Today I Was a Cat is Maine children’s music performer Mary Kaye’s fifth album. Kaye has a pleasing and friendly voice, reminiscent of Dar Williams. On this album she presents twelve little gems of everyday occurrences and observations. The CD opens with the lightly rocking “Rolling Down the Hill,” which recalls the joys of summer. “Little Ghost” explores the world of children’s imaginative play, while “Mr. G. G. Jewel” is the first of several songs that celebrate the wonderful world of cats. “Underwater Wave Parade” is a horn-aided, silly march about aquatic life, while “Bus Ride” employs some cool rhythms, electronic percussion, and percussive vocalizations to simulate the sounds of a vehicle heading to grandma’s house. Kaye has a real talent for setting childhood emotions and experiences to distinctively contemporary arrangements. Songs like the lovely “Bloom” about flowers growing, never sound contrived, because Kaye manages to convey a child-like sense of wonder. “Love Factory” and “Alligator” sound like they could easily come from the pop-folk pen of artists like Alanis Morissette, The Nields, or Jewel. The album’s title track “Today I Was a Cat,” is sure to become a favorite of feline fanciers, while “Squirrel Footprints” explores the different kinds of impressions we leave behind. The album closes with “Statue,” which perfectly captures children’s fascination with the things adults seldom notice. Kaye’s strong singing and skillful acoustic guitar playing is supported by a group of excellent musicians including Dave D’Aran (producer/bass/electric guitar/keyboards/acoustic guitar/virtual drums/sequencing), Andrew Beale (v-drums/ride cymbal/shaker), Sally Wituszynski (violin/viola/cello/keyboard), Jeff Wituszynski (bassoon/baritone saxophone/tenor saxophone/bass), Ken Godel (double bass), and Elijah D’Aran (keyboard). The CD packaging is both eco-friendly and appealing, with nicely conceived illustrations by John Klossner, and the added bonus of an insert sheet with full lyrics. Encourage your kid’s imagination with Mary Kaye’s upbeat folk rock on Today I Was a Cat. Check out the sweet ”Love Factory” by tapping the cover. …Mary Kaye reaches out to younger listeners on her latest album. Lyrics are clever on these dozen original songs featuring several musical styles. Opening with “Rolling Down the Hill,” Kaye sings about the joys of tumbling down a hillside in summer. “Little Ghost” is a Caribbean/fusion/spooky song about the problems encountered by some ghouls; this funny number would be perfect to use with preschoolers during Halloween time. “Mr. G. G. Jewel” is a story-song about a cat who is supposed to scare away mice from the jewelry store, but parties with them after closing. Other standouts include “Underwater Wave Parade” (a march), “Bus Ride” (a minimalist, jazzy ride to grandma’s house), “Love Factory” (a country-flavored tribute to a loving, giving child), and “Alligator” (a jazzy song about the “king of the swamp”). Perfect to listen to during art time (for inspiration) or during naptime (when relaxing). Award-winning children’s musician Mary Kaye presents Today I Was a Cat, a brand new album of her original, creative, and delightful music. The whimsical, tongue-in-cheek lyrics and catchy melodies will appeal to all ages, making Today I Was a Cat an excellent pick for family car trips, gift-giving at children’s parties, or babysitting entertainment. Highly recommended! Today, Mary Kaye Stays Cool as a Cat - This week, I shall be reviewing Mary Kaye. No, I’m not talking (or linking) to the cosmetics company. I’m talking about Maine-based childrens recording artist Mary Kaye. She recently released her fifth CD of original tunes, TODAY I WAS A CAT. All artwork is by noted illustrator, John Klossner,who does the comics for Computerworld (a publication I’m familiar with through my day job in software). A longtime educator and performer for young audiences, Mary Kaye writes from a child’s perspective on many of her tunes. For instance, on the title track: Today I was a cat. In a tiny spot I sat. Where the sun shines through the window and it warmed me. I curled up in a ball. I didn’t do anything at all. The house made quiet sounds in harmony. “Love Factory” and “Underwater Wade Parade” typify the album’s gentle, somewhat silly theme. In the latter, Mary Kaye envisions a selection of aquatic antics as she sticks her head in the sea. Will it get water-resistant kids to dunk their heads? Who knows, but it’s worth a try. Mary Kaye straddles the niche between folk and alt-rock. I looked for a musical comparison for the occasions when Mary Kaye rocks out. In what may seem like a stretch, I thought about Patti Smith during “Rolling Down the Hill.” And believe me, I can’t even picture Patti singing the song. Matt (who is 2) enjoyed singing along with “Alligator,” with its chorus of “Uh-oh Oooh.” Mary Kaye is definitely not the cosmetic company. And her music goes deeper than a powdery or latex layer on your skin. Her songs get into your head, which improves your aesthetic. That trumps cosmetic any day. We see it in the light sky after dinner. We feel it in the air that doesn’t require us to zip up coats anymore. And we can see it in the green buds poking their heads out of the earth. Spring is here! Celebrate its arrival with this pretty song from a long-time Cool Mom Picks kindie favorite, Mary Kaye. “Bloom” off of her newest release, Today I Was a Cat, is a pretty ode to the colorful flowers that are appearing all around us now that winter is headed out. With her unique voice, this is the perfect song to remind us all to stop and smell those pretty things appearing in our yard. Whimsical, folksy and funky is how I would describe the latest CD by Mary Kaye. While this could definitely fall into the kindie rock category, I love the dancing and laughing that comes with it including acoustic and jazz music. It is quite an interesting and fun combination. My preschooler loves funny and imaginative songs and (probably because we have three cats) her favorite songs to boogie to are “Today I Was a Cat” and “Squirrel Footprints.” I always appreciate insert booklets with lyrics so I can learn the words and slow it down a bit to teach my older daughter. I also love the fact that Mary is also a mom to two daughters. Yeah, sisterhood! Music for families: Today I Was a Cat - Pop in a toddler music CD for a smoother car ride. 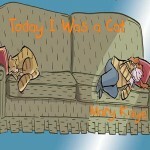 Try “Today I Was a Cat” by Mary Kaye. The kids will love the story-like lyrics and the grownups will like the indie-folk rock sound! Mary Kaye celebrates her latest release Today I Was A Cat and you will too! Original music for kids and their families filled with story-like lyrics, distinctive characters, and an indie folk-rock sound.